The garages of Beverly Hills are pretty much all full of fabulous cars all the time. But only one is LeMans-themed, and has hot rods, motorcycles, a 1929 Bentley, and a wooden speed boat. This particular parking lot belongs to Bruce Meyer, Los Angeles businessman and car enthusiast with the means to realize his unique vehicle-collecting fantasies. Heck of a nice guy, too. Meyer, not to be confused with Bruce Meyers who invented the Meyers Manx dune buggy, began his collection with a Chevy V8-swapped Mercedes gullwing. 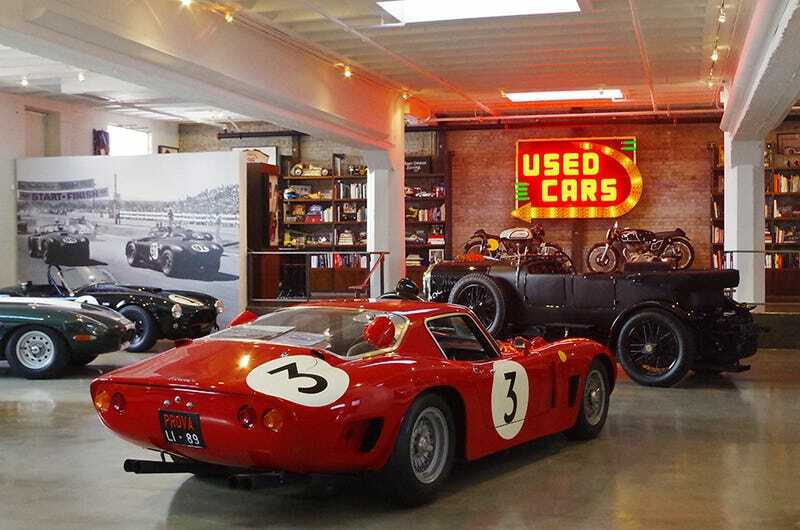 But as he started putting serious money into this private museum, currently tucked discreetly in to a regular-looking downtown Beverly Hills building, he changes his focus to original-spec restorations. Except for the hot rods. And race cars. With a few show medals from the Pebble Beach Concours d’Elegance and many miles in some serious vintage-car rallies, Meyer is a significant fixture in the car collecting world today. I was lucky enough to meet him at a tire shop of all places (albeit, a really nice tire shop) and he invited me to stop by his outfit to check out his toys. Like everyone’s favorite hero car guy Jay Leno, Meyer keeps all his cars in operable pretty-much-ready-to-drive condition. And they don’t just roll to car shows– the Bentley has rallied in Europe and the U.S.
I’m not the first one to see his parking lot of LeMans winners or take photos of the facility, and definitely not the first to hear about how he bought Clark Gable’s 1956 Mercedes 300 SC from the actor’s widow. So even if you don’t get the chance to see Meyer’s parking garage for yourself, keep your eyes open for his cars on the streets of L.A. and just about anywhere else classics are gathering! Meyer is also on the Petersen Automotive Museum board, so items from his own collection might end up in there from time to time as well. I’ll simply indulge you in a few detail photos of the garage– an angle you might not have seen of a beautiful museum few people get to see at all. Enjoy. Miss Daytona deserves a photo gallery of her own, but you’ll have to make do with this tease of the 1929 Miller-powered step hydroplane. My very favorite thing in the room, besides the light-up “USED CARS” sign, was this 1929 Bentley. And based on its prominent parking spot I’d say it must be one of Meyer’s favorites, too. 4 and a half liters, and a gear-selector I probably couldn’t figure out in an hour. Apparently the middle-pedal is the throttle? What really gets me excited about this car is the unique vibe of rugged aristocracy. At the time it would have been like, well, a Bentley– one of the finest and most advanced slabs of metal you could move yourself around in, reserved for the ultra-wealthy. But it’s still so much damn work. Driving it would require as much lever-action as a modernish tractor. And you know you’d be getting splattered with bugs, rain, mud. Just look at those headlight guards! Just staring at this thing in the grille takes me to a time when there simply was no escaping the harshness of travel. Something cool about that.